We always go to friend's house for Pork and Sauerkraut. I love it and they serve it over Mashed Potatoes...yum. Happy New Year. How sweet, you had a romantic evening! I'm with Gary. Love sauerkraut too! This was such a pleasure to read. I love hearing about food and relationships. They so often go hand and hand! 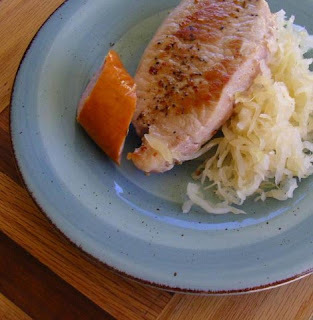 I never knew that pork and sauerkraut brought good luck. In my family, it is black eyed peas! I hope you had a lovely weekend. Please have a happy and joyous week! Loved reading this post! Really well written, and I definitely had a smile on my face by the end. :) I love sauerkraut too, my grandmother's especially, but I think part of the appeal is looking forward to having it once or twice a year... I dont know if it would seem so special if I had it once a month! In any case, great post !